Our miso factory is located 8 blocks away from Okazaki castle, hence the name "Hatcho" meaning "8 blocks". Okazaki castle is where Edo Bakufu's Shogun, Ieyasu Tokugawa was born. 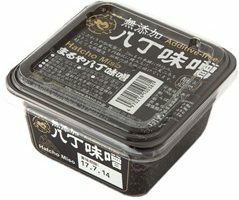 We produce hatcho miso using the original recipe from the old days, conveying the traditional taste that even Ieyasu Tokugawa loved. Hatcho miso uses soybean and salt as raw materials. 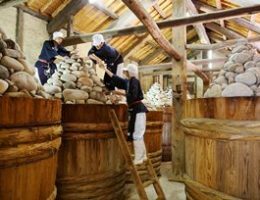 Around 3 tons of heavy stones are stacked up on top in a wooden pail about 2 meters high. It naturally brews for over 2 years, creating a deep flavor of soybeans. 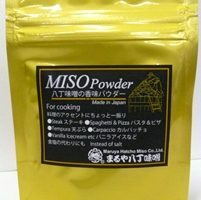 In order to keep the authentic color and taste of Hatcho miso, we spend 2 days to roast it with hot air and low temperature and turn it into powder form. 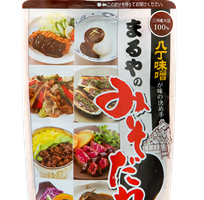 You may enjoy the flavor of Hatcho miso easily by sprinkling it on different dishes.